Synopsis: Dave Skylark and his producer Aaron Rapoport run the popular celebrity tabloid TV show “Skylark Tonight.” When they discover that North Korean dictator Kim Jong-un is a fan of the show, they land an interview with him in an attempt to legitimize themselves as journalists. Thoughts: Back in June of this year, The Interview was already in hot water. 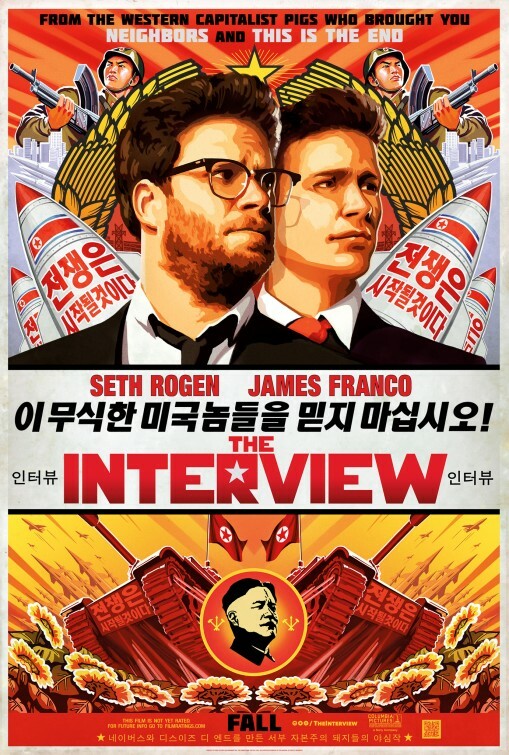 A news agency in North Korea vowed retaliation against the studio distributing the comedy (Sony/Columbia), warning all involved of their plans. Sony, undeterred from any potential backlash and encouraged by positive test screenings moved the release date from an early October bow to prime holiday real estate: Christmas Day. In the last few weeks it seems the promise from North Korea was made good on when Sony suffered a massive hack of their internal e-mails, exposing the inner dealings of studio heads and filmmakers to public embarrassment. Though deep down I secretly hope this is all a massive prank to promote the film, one has to wonder how worth the risk the film will end up being. Even considering that I’m not a huge fan of James Franco (Oz, The Great and Powerful) or Seth Rogen (This Is The End) I have to say that the sheer audacity of the offensive premise of The Interview earns them some small credit in my book. Will Sony be laughing all the way to the bank with egg on their face?